Pat Fenlon reckons Hibs will become a far more vibrant proposition once he can call on the services of his creative quartet of Abdellah Zoubir, Danny Handling, Paul Cairney and Alex Harris. While the Easter Road side are in a rich vein of form ahead of Saturday’s visit of Celtic – they have lost only one game in eight – the manager knows they could do with the injection of spark that one or all of the aforementioned players will provide. French winger Zoubir is edging closer to a first Premiership start as Fenlon introduces him gently following his loan move from Ligue 2 side Istres, while Cairney, who has been out since the start of the season, and Handling, who has missed the last five games, are back in contention for first-team involvement after their injury lay-offs. Harris still has a bit longer to go after undergoing surgery on his broken ankle last week, but nonetheless Fenlon is already relishing the prospect of having all his flair players fit and firing. Fenlon revealed his excitement about the prospect of soon being able to hand Zoubir his first Premiership start. The 21-year-old has featured in each of Hibs’ last five matches, but his only start came in the League Cup win over Stranraer when he capped an impressive performance with a goal. 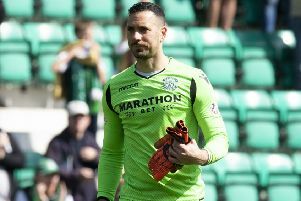 The manager has chosen to be patient in terms of bedding the Frenchman in, but he promised Hibs fans that he is not far away from unleashing him from the start in a league match. “Zoubir’s doing well,” said Fenlon. “He’s had a few days back in France [during the international break] but he’s back in training now and he’s looking good. He’s starting to gel with the group and his English is improving. He’s definitely one for the rest of the season. He’s a different type of player to what we have. With Harris out injured, he gives us something different in the wide area as well as being able to play off a striker. Fenlon is braced for a formidable test when unbeaten league leaders Celtic head to the Capital on Saturday lunchtime, but he insists his side are in good enough shape to pull off a repeat of their Easter Road victory over the champions last December, when Leigh Griffiths scored the only goal of the game. “It’s always tough when you play Celtic no matter what their form’s like because they’re such a powerful team,” he acknowledged. “We’ll need to play really well to get something out of the game, but we know we’re capable of doing that with the players we have. We’re on a decent run so there’s a confidence about us at the minute. While Cairney and Handling are back in contention for the weekend, Tim Clancy, Jordon Forster and Harris remain sidelined by injury and Sam Stanton has been added to the treatment table after picking up a hip knock during the week.